Weddings in India are slightly different from the ones abroad. In India, they truly are a joining of two families, rather than just two people. To celebrate this sentiment, Weddingz.in conducted a contest on their Instagram page, giving away one lucky couple and their family a free pre-wedding photoshoot! Once they were all ready, we were stunned at how amazing the outfits looked! 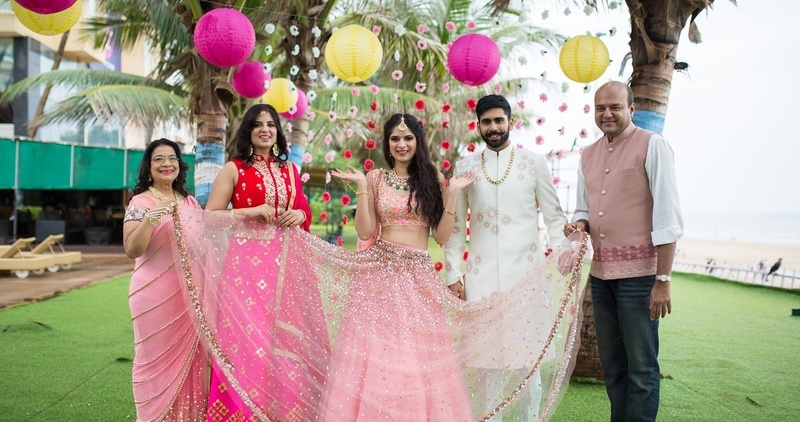 Papa Don’t Preach’s lehengas are way too gorgeous while SS Homme’s menswear can make anyone look dapper. The jewellery by Just Jewellery was the cherry on the cake. The dessert trolley arrived at noon. The family was surprised to see all the goodies! They all fed each other and broke the awkwardness. Bonding over cakes is the best! Lunch was at 1 pm, during which the families spoke excitedly about all the wedding planning and prepping that had to be done! Post lunch, we moved onto Novotel's famous Gadda Da Vida Lounge. Here, the family the families seemed quite comfortable with each other! Jokes and stories were exchanged over shots of Campari. Moving onto champagne and wine, the atmosphere grew more and more friendly and familial. The next segment was the actual, outdoor shoot conducted by the pool, overlooking Juhu beach. We couldn't have asked for a more romantic setting! We had a curtain of flowers between two trees and big, colourful chinese lanterns hung on a string. Shyamalee Thevar Events did a fantastic job with the decor. Our photographers, The Wedding Crashers, clicked some amazing, romantic pics of the couple after which the family got into the frame as well. The mood shifted from romantic to funny and soon, the family were posing with cute, hilarious cut outs. Following what the cut outs said, the family recaptured the quotes in a hilarious manner! The bonding and the romance and the funny moments all blended together to create one amazing experience for the families. The photoshoot was wound up by 6 p.m.with some great shots and an even greater experience. Location: Novotel, Juhu - Hair and make-up at Wedding Suite, Brunch at The Square, Gadda Da Vida and their poolside location.